Google announced a big change to AdWords back in May and in July the official rollout felt like Christmas came early. For years, every digital advertiser lived by the 25-35-35 character mantra and agonized over fitting brand message into those stringent limits when launching AdWords ad campaigns. The next generation of advertisers will eat, sleep, and breathe the 30-30-80 character rule. 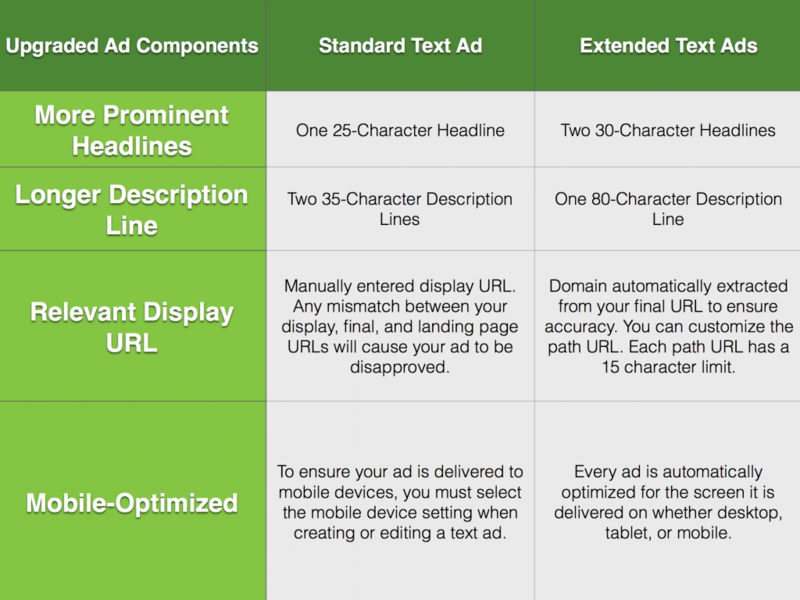 One month after Google’s the expanded text ads announcement we’re looking at what these major changes mean, how to get the most bang for your buck, and what advertisers need to know to migrate from standard text ads to expanded text ads. As of October 26, 2016 advertisers will no longer be able to create or upload standard text ads. Here’s what you need to avoid costly AdWords campaign mistakes and how to leverage this new ad format. Expanded text ads offer 47% more space for your ad copy with two 30 character headlines and an 80 character description. Like Standard text ads, ETAs are available on the Google Search Network and Google Display Network. Both automatic and manual ad extensions are fully compatible with the expanded text ad format. Google designed ETAs to accommodate the seismic shift in how consumers are now interacting with brands across multiple devices. ETAs will display across desktop and mobile devices AND automatically adjust the format according to the user’s screen size. Out of the trillions of searches happening on Google, over half of those searches are happening on mobile. And, looking at data from millions of websites using Google Analytics today, more than half of all web traffic is from smartphones and tablets. Advertisers can now better engage their audience by delivering a mobile-first experience to potential buyers in their preferred context. What will Change from Standard Text Ads to Expanded Text Ads? Make sure you have AdWords Editor version 11.5 or later. If you don’t, don't worry! You can download it free here. 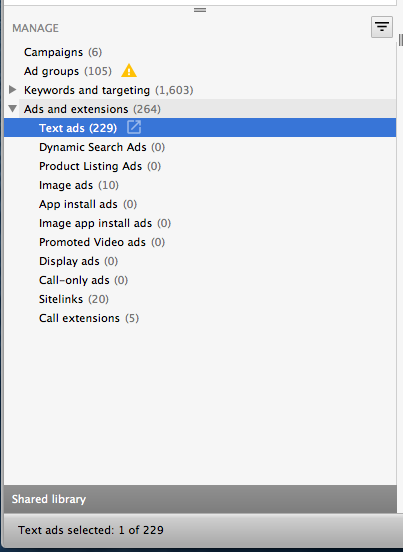 Launch AdWords Editor, select ‘Ads and Extensions’ tab on the left table. Select all the text featured on the main screen and paste into a spreadsheet. To update your existing standard text ads to the ETA format, you’ll need to create your new columns. So you can easily see copy changes, put the new columns to the right of their respective previous column. Insert the =length( function to make sure you don’t go over the character limit for each column. New Headline 1 = 30 characters; New Headline 2 = 30 characters; New Description = 80 characters. Now that you have your spreadsheet is setup, you can quickly rewrite your old text ads and transition those into Google’s new expanded text ads format. Headlines are more important than ever. With the extra headline field, use that space to focus on deeper messaging that resonates with your intended audience. While longer headlines increase the clickable space of your ad, your first headline still remains the most important real estate space. Some advertisers have noticed the second headline truncated when viewed on desktop. Be sure to include the most important message (and keywords) in the first headline. The ETA format now automatically pulls the domain from your Final URL as your display URL with the option to include two 15 character path fields as an appendage to the display URL. Use these two fields to indicate to your searchers where they can expect to see after the click. More importantly, use this space to include top performing keywords to improve relevance and improve your ad’s overall quality score. Review how your ad, as a complete entity, supports your client’s message. Analyze your historical data and try to come up with new tests to run with your ETAs. This means assessing everything from the ad creative to ad extensions like callouts, reviews, snippets, and more to strategically optimize your ads. Have you been testing out the new Extended Text Ad formats? Let us know if you've found any tips to share in the comment section below.